Salesforce is betting big on mobile with the launch of a new solution allowing marketers to extend their personalised customer engagement strategy into mobile apps and wearables. The news comes as the CRM vendor strikes what it claims is a first-of-its-kind global partnership with Omnicom, which sees the agency giant adopting the full Salesforce ExactTarget Marketing Cloud technology stack in order to provide clients with an end-to-end customer engagement strategy that taps into their own customer data. The new Journey Builder for Apps stems out of Salesforce’s Journey Builder customer management capabilities and is the latest piece in the vendor’s marketing technology cloud stack. 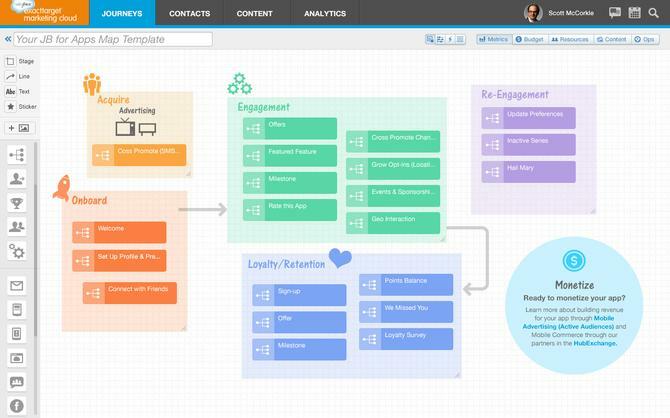 The wider Salesforce ExactTarget Marketing Cloud is grouped into five other feature sets: Journey Building, including customer journey mapping and analytics; Data, including segmentation and predictive intelligence; Content, including asset management and workflows; Channels, including email, SMS/MMS and social campaign management; Analytics, including reporting, dashboards; and Web and mobile analytics. The new mobile app management tool integrate directly with the rest of the Marketing Cloud and Salesforce’s CRM solution, and is aimed at giving brands the ability to build customer journeys in the mobile environment. In a press briefing, Salesforce ExactTarget director of product management marketing, Derek Laney, said Journey Builder for Apps would help brands build an “uber-like” app experience based on identifying both a customer’s preferences as well as their location. The vendor is leveraging its acquisition of the Heroku software developer platform to build these mobile applications. Laney said it is also providing “best practice” templates of “pre-defined customer journeys” to help customers map out the types of interactions and messages required for a particular customer engagement. With the rise of capabilities such as geolocation and beacon technology, mobile apps are fast becoming the tool that brings together the digital and physical environments for a customer, he said. “If you are a marketer trying to think about the entire customer experience and not build an app for an app’s sake, this acts as a connecting tissue between all the things a customer is doing in the real world, all the things they’re doing digitally, and how you manage the communications and interactions across that whole journey,” Laney explained. Online betting and gaming business, William Hill, will be one of the first customers in Australia to take advantage of the capabilities of Journey Builder for Apps. "At William Hill, we recognise that providing a great multi-channel experience delivers increased value for both our customers and our business," said its CMO, Isaac Ward. "ExactTarget helps us build seamless customer journeys across all devices and platforms." The latest product update is being unveiled at Salesforce’s Connections US event this week. Several Salesforce customers, including Diesel and McDonalds, are expected to talk through their use of the Salesforce Marketing Cloud and modern marketing efforts during the event. Salesforce has also announced an extended partnership with Omnicom Group, which will see the global agency giant roll out the vendor’s full Marketing Cloud to deliver more personalised customer engagement and management services for its clients. Laney told CMO the alliance with Omnicom will give an agency an operating system to manage billions of customer engagement interactions, end-to-end, on behalf of their biggest clients for the first time. The new offering will be managed by Omnicom’s data, technology and analytics arm, Annalect, and available to all geographies. The latest deal comes off the back of an alliance struck between the two organisations last year, which saw Omnicom deploy Salesforce’s social listening platform in order to onsell a range of social marketing capabilities to its client base. Customer data can also be integrated with mobile, email and social intelligence data coming in from Omnicom’s DMP to further personalise and improve interactions online as well as off, he said. “This allows the agency to create a single customer view as a trusted advisor to that brand,” Laney said. In a statement, Omnicom Digital CEO, Jonathan Nelson, noted the complexity marketers are facing in an always-on and always connected environment. “By bringing together Omnicom with Salesforce... in a way that has never been done before, we will be able to span every consumer touchpoint, both online and offline, which is a real first-mover advantage for our clients,” he said. Omnicom said it plans to offer clients an end-to-end customer journey management, as well as deliver marketing analytics to provide better insight into the customer. The agency also pointed out its creative network will now be able to build more connected apps in conjunction.